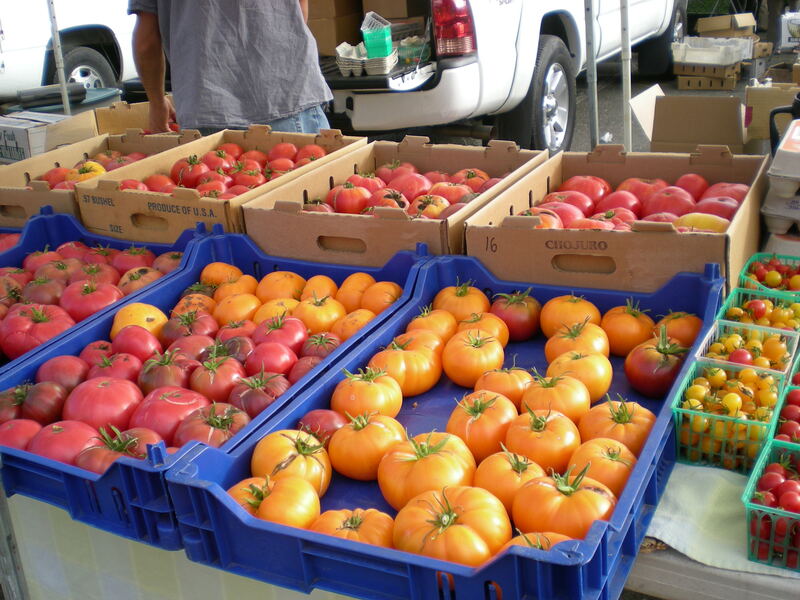 On Saturday we like to go to the local Farmers Market and forage for the food we will eat during the next week. It’s a lot of fun to see what everyone has brought to the market. There’s live music and ready-made food (not generally Paleo) for those who ran out of the house hungry. It’s fun to talk to the farmers about their products. The people watching is excellent. The energy there is good. 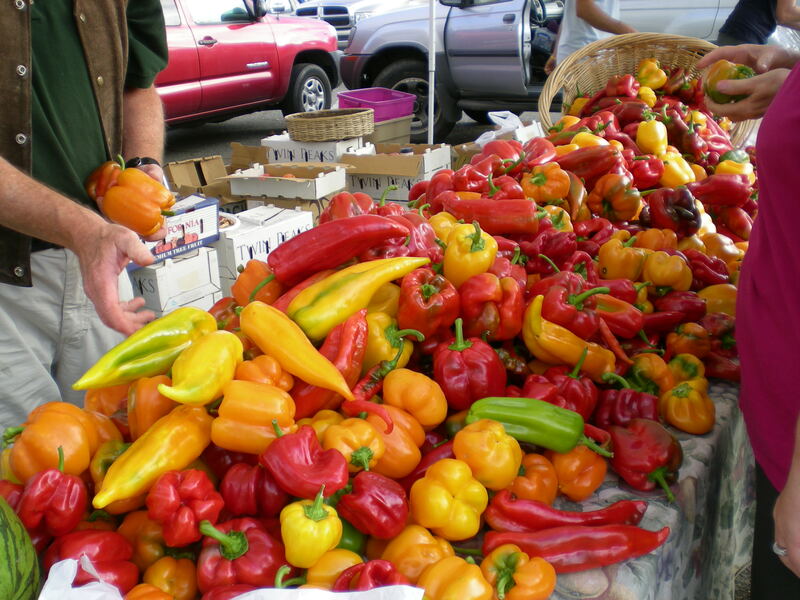 A beautiful array of peppers to choose from. 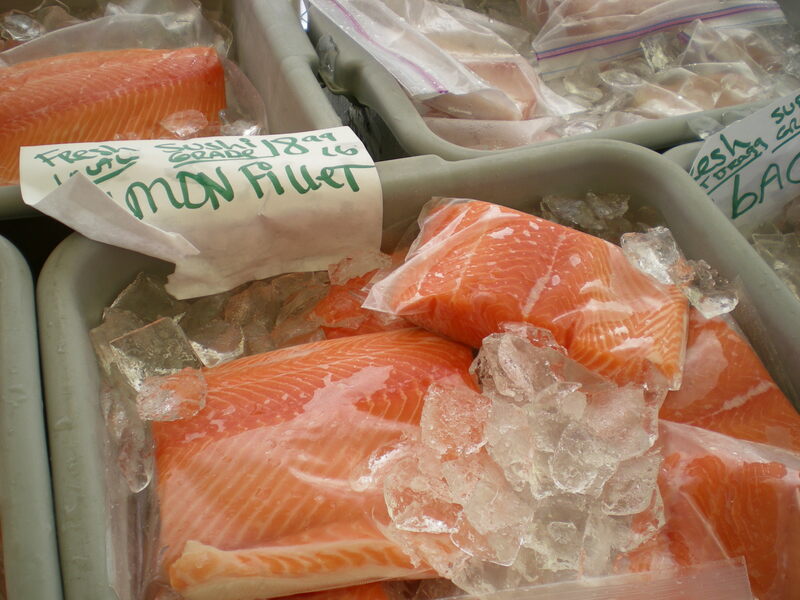 The Farmers Market is a great place to find produce that you don’t normally see in the supermarkets. 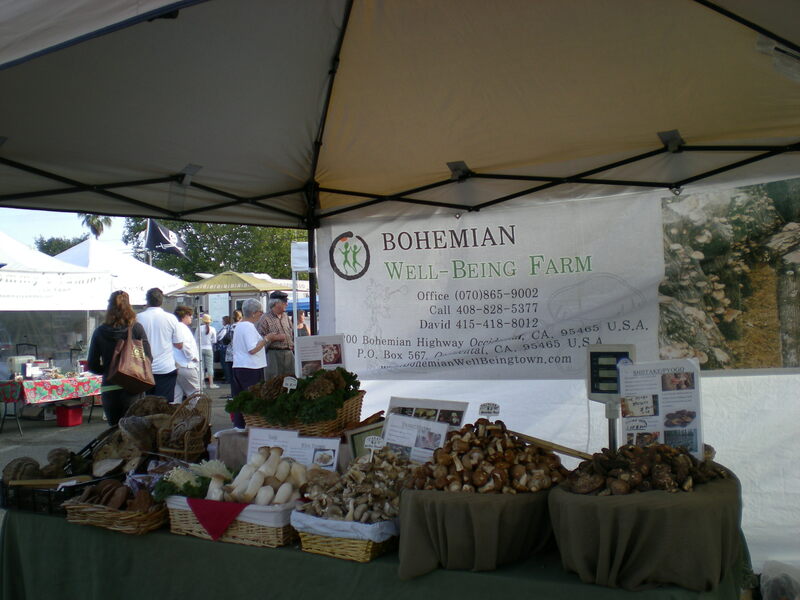 Bohemian WellBeing Farm has a wide variety of unusual and delicious mushrooms. I love the trumpet mushrooms sautéed and used as omelet stuffing. Look at these beautiful tomatoes! I don’t know how much longer they’ll be available, but I intend to enjoy them as long as they are. Now to find something to have for dinner tonight. The salmon looks pretty good..
From left to right (sort of): Wild King Salmon fillets, Pork Andouille Sausage, shallots, trumpet mushrooms, tomatoes, garlic, grass-fed London Broil, cilantro, zucchini, red onions, basil, beets spring mix, pastured eggs, broccoli and duck wings. The duck wings are for the Airedale Terrierists who are raw fed. Queen Barktifah and Muffie Stuffie Sucker will be ecstatic when they see their Sunday breakfast. Duck is like crack for the Terrierists. I love to shop at the Farmers Market. I’m getting tasty, fresh food, grown by local people who I can talk to. I have a lot of fun every week figuring out what to make from the bounty I have foraged. It’s a creative outlet for me. 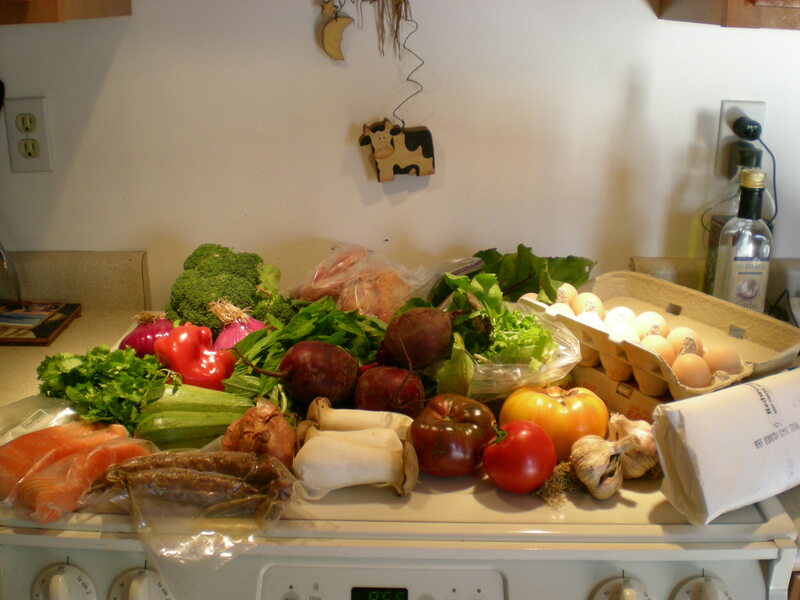 This entry was posted in Musings and tagged Airedale, Farmer's Market, Paleo, Paleo diet, Paleo Lifestyle, sustainable food. Bookmark the permalink. I love our local farmers market also. 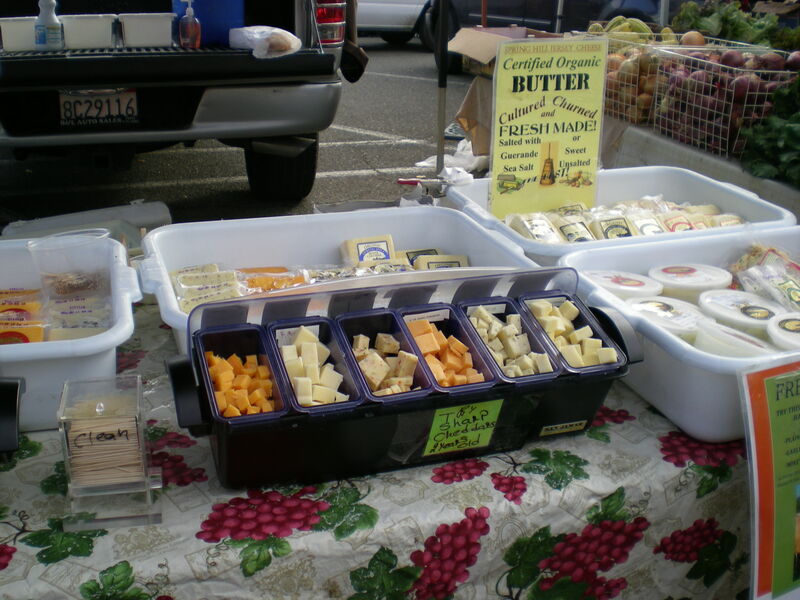 I am so glad that there are so many local farmers markets out there now.